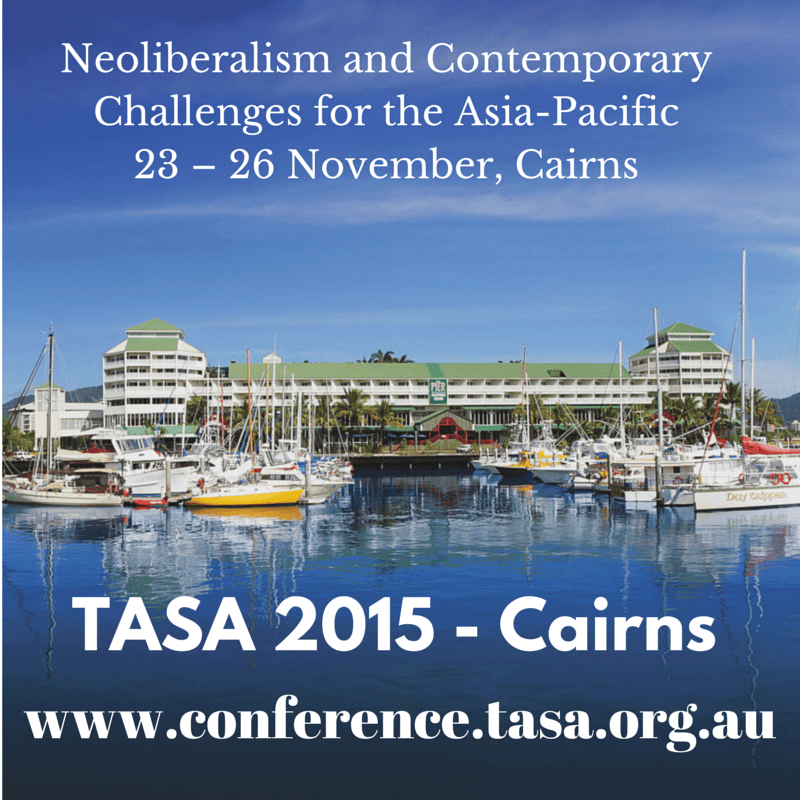 The Australian Sociological Association’s (TASA) conference this year is being hosted by The Cairns Institute and the College of Arts, Society & Education at James Cook University: Neoliberalism and contemporary challenges for the Asia-Pacific. November 23 – 26, 2015, Cairns, Australia. As a global structure, neoliberalism has impacted lives around the world in far more than an economic sense. This conference provides us the opportunity to further seek to understand the global effects of neoliberalism, but especially the ways neoliberalism is experienced in different local contexts. The experiences of Australia and New Zealand are different from those of Asia and again of the Pacific. What challenges and opportunities does neoliberalism present and how does sociology respond to those challenges? As far as we know, there has never been a TASA conference held this far north. But Cairns is ideally placed to bring together work from across Australia and the Asia-Pacific. Cairns is easily accessible from all Australian airports, and also hosts an international airport with regular flights to East and Southeast Asia, including direct links to Tokyo, Osaka, Guam, Port Moresby, Shanghai, Hong Kong, and Singapore. Conference delegates can take advantage of the excellent tourist infrastructure in the Cairns CBD, and might like to extend their stay to explore more of North Queensland. Though it will be hot, all conference venues are air conditioned for your comfort, and we recommend a ‘Tropical Smart Casual’ approach to your conference wardrobe. The conference will be held at the Shangri-La Hotel in Cairns city. Located at the Marina, the best of Cairns city is at our doorstep. All conference delegates are invited to participate in our post-conference tours. You can choose from three day trips: one to the Great Barrier Reef, one to Yarrabah Aboriginal community, and one to the Atherton Tablelands. All tours will be led by a social scientist who will discuss the space for sociology in these places. Spaces are limited to register early to avoid disappointment!